SAN FRANCISCO (AP) A pair of tiny replica All-Star jerseys hung in Jed Lowrie’s locker, gifts for his two young children. After a scary collision in right field, the Athletics second baseman is hopeful he’ll still be able to wear his during next week’s gala in Washington. Lowrie had to come out of Oakland’s 7-1 loss to the San Francisco Giants on Friday night because of a bone bruise and calf bruise in his left leg. The first-time All-Star appeared to move around fine in the clubhouse after the game but is listed as day to day. Lowrie collided with Stephen Piscotty while both chased Alen Hanson’s fly ball to short right field in the third. Lowrie remained down for several moments, stayed in the game and struck out in the fourth before coming out. Lowrie’s status for Tuesday’s All-Star Game in Washington is uncertain. The 34-year-old Lowrie was added to the AL team earlier this week as an injury replacement for Gleyber Torres of the New York Yankees. 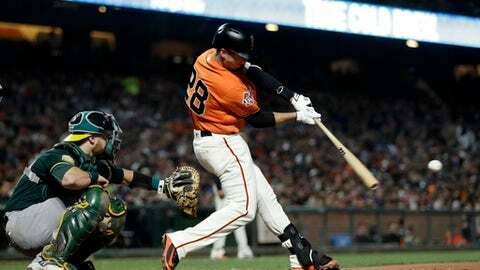 Buster Posey singled in the go-ahead run in the sixth inning for San Francisco. Madison Bumgarner pitched three-hit ball over six innings to win consecutive starts for the first time this season. Hanson added two hits and Steven Duggar had two RBIs and scored twice. The A’s had won 19 of 24 and took three of four from AL West-leading Houston before falling to their rivals from across the San Francisco Bay. Bumgarner (3-3) allowed one run with five strikeouts in his third consecutive win over the A’s. The left-hander retired 14 straight during one stretch and left after giving up a single and two walks in the seventh. Reyes Moronta replaced Bumgarner and retired three straight to get out of the jam. Chad Pinder homered for Oakland. A’s manager Bob Melvin said the game changed when his ballclub failed to score in the seventh. Neither team did much offensively early and the Giants scored their first run on a balk by A’s starter Edwin Jackson (1-1) in the fourth. Posey came through in the sixth. Duggar drew a leadoff walk. After Brandon Belt struck out, Andrew McCutchen singled and Brandon Crawford popped up. Posey followed with a sharp single to left. Posey was batting fifth for the first time this season as part of Bochy’s attempt to shake things up. Jackson yielded two runs over six innings but lost in his second attempt at his 100th career win. Jackson struck out five and walked three. ”My front spike just caught the dirt. I’ve done it before. The other times I’ve done it, no one’s been on. One time I threw a strike. I’m not sure how. One time I just held onto the ball.” – Jackson on being called for the balk. Athletics: Khris Davis did not start because of a sore left shoulder but played left field after Piscotty moved to second when Lowrie was removed. … RHP Josh Lucas was optioned to Triple-A Nashville. LHP Jeremy Bleich was called up. RHP Andrew Triggs was transferred to the 60-day disabled list. RHP Jeff Samardzija (1-5, 6.42 ERA) tries to get his injury-riddled season back on track for San Francisco in the middle game of the series. LHP Brett Anderson (1-2 5.45), who was part of a combined five-hit shutout in his last start, goes for Oakland.